Ginataang tilapia is another simple and easy Filipino dish. It is usually consist of tilapia fish cooked in a combination of coconut milk and some spices. There are many other ingredients that can be cooked with Coconut milk but the most available fish in the local markets here is Tilapia, try this favorite yummy fish dish and surely your taste buds will crave for it before you laid it in your dining table. 1. Pat-dry tilapia then rub with MAGGI MAGIC SARAP. Arrange in a pot. 2. Combine onions and tomatoes in a small bowl. Spread evenly on top of each tilapia. 3. 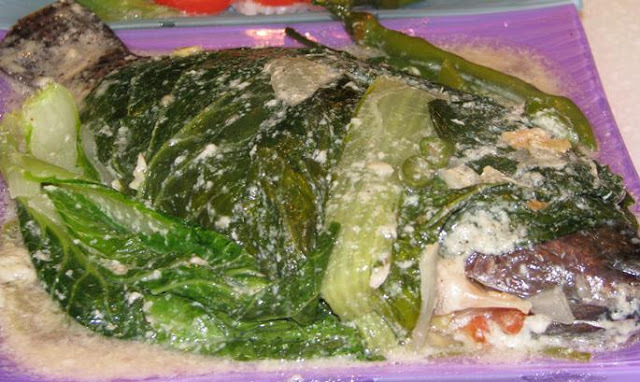 Pour coconut milk on top of tilapia and wrap each in wilted banana leaves. 4. Cover pot and steam for 10 minutes or until done.